who would have been heavily involved in the game shoots that would have taken place on the Clifton estate and elsewhere. It is a sporting scene which was very popular and commercial with the Victorian shooting fraternity. A beautifully painted studio piece of a Grouse, four Ptarmigan and a Blackcock which were all coveted game birds of the period. As always with Ansdell great care was taken to capture the realism of each bird and the props are carefully placed to add a pleasing composition. All the props used in this painting can be seen again and again in other paintings and he was known to have a selection of useful items in his studio. The pannier is especially well painted and was a favourite prop – over the years he perfected the wickerwork on this. It would have been used by the ghillie to carry the game down from the hillside. There is a metal flask attached to the side either for water or for gunpowder. The walking stick is there to complete the composition. There are some loose feathers that are so realistic that they could float away at the merest hint of a breeze. The plaid or blanket was a favourite and was probably made of Scottish wool picked up during his frequent visits over the border. The clay pipe is rather a grand one with a metal lid attached by a chain. This gives the impression that the ghillie will be back very soon to take the game bag home. 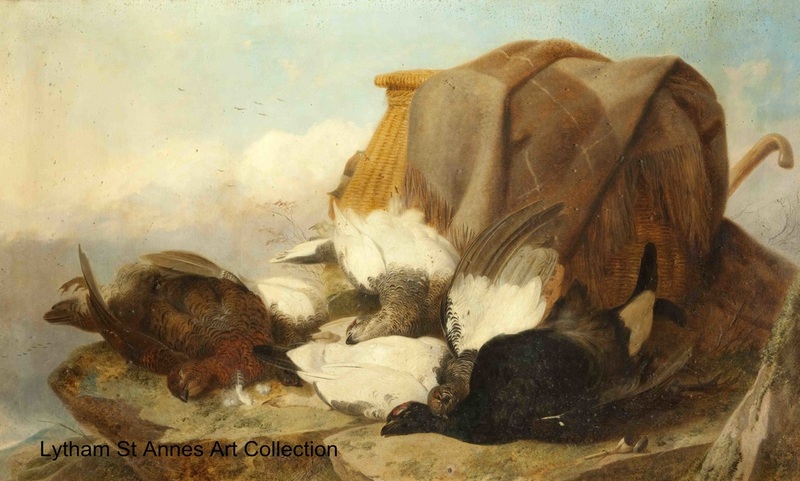 Ansdell was known to have made intricate studies of dead birds – mainly game birds – as he accompanied many members of the aristocracy and landowners on their shooting expeditions as an artist in residence so he had plenty of scope for this. It was through his sporting paintings that he became well–known and in high demand, recording these shoots before photography was universally used. He was fascinated by the plumage of birds as can be seen in this painting. He saw a dead bird as a thing of beauty and never overdid the blood. He would make intricate studies of these birds in his studio directly from the dead bird.